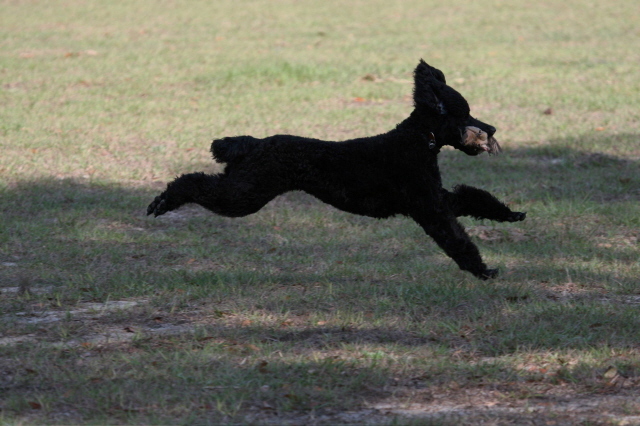 I'm one of the few standard poodle owners that actually hunt test and hunt their dogs for real. For the last several years going back as far as 1995 I've hunted successfully for both ducks and pheasants in Wisconsin, South Dakota, and lately North Dakota over poodles. 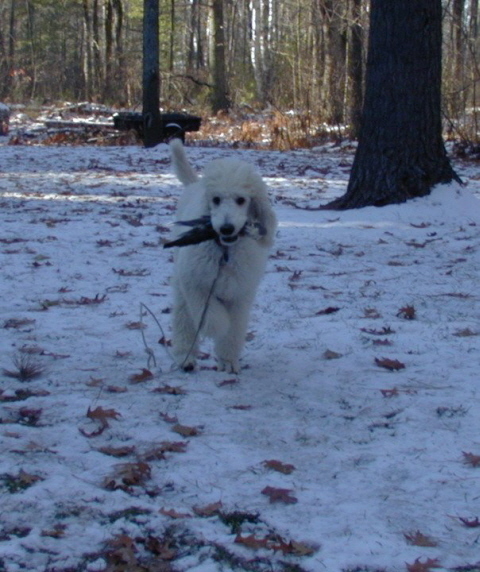 Our third poodle, Nero, now at the bridge, was the first poodle I trained to hunt and retrieve. He loved it. 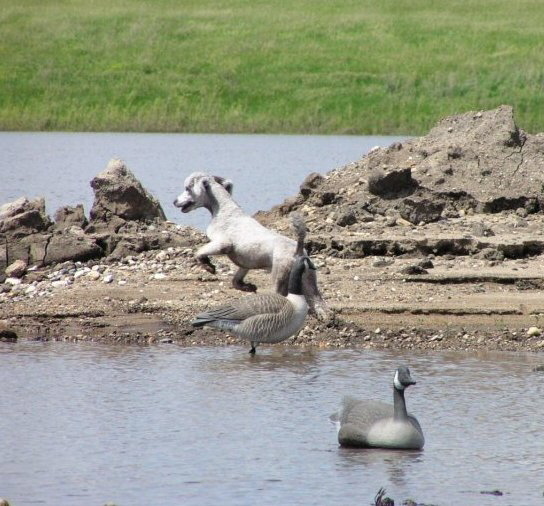 Now, both Beau and Scout retrieve big Canadian Geese no differently than a duck or pheasant. I haven't tried Callie on geese yet. Check out the Journal page for stories and pictures. 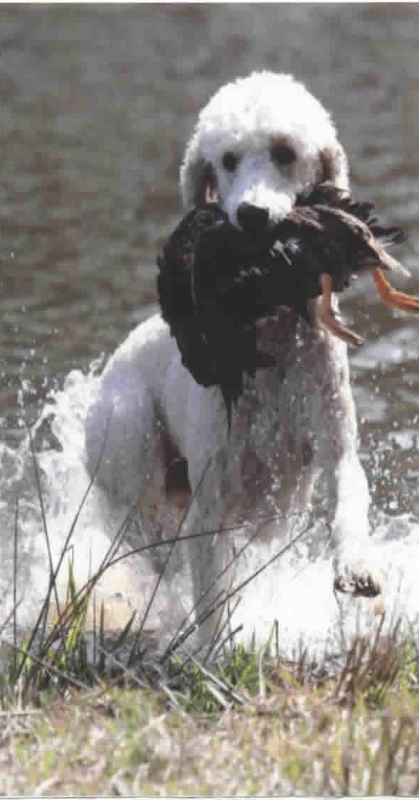 A picture of Beau retrieving a Canadian Goose was published in the Retriever Journal magazine. If you have a chance look for a June/July 2011 issue of Gun Dog Magazine. 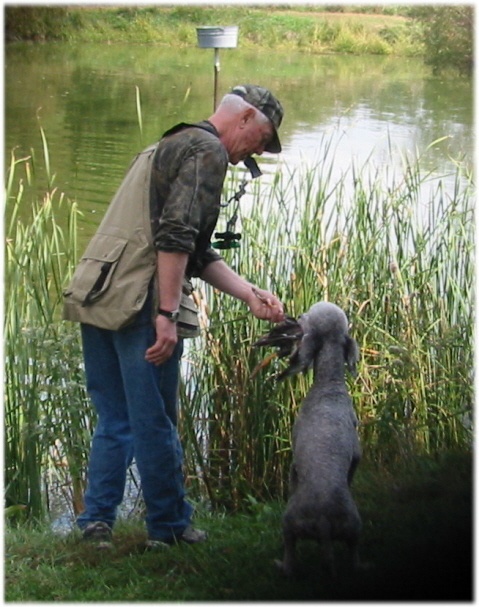 There is an excellent piece about poodles making a come back in the field, written by James Spencer, with help from three current poodle owners that hunt theirs regularly. I'm one of those that contributed to the article. 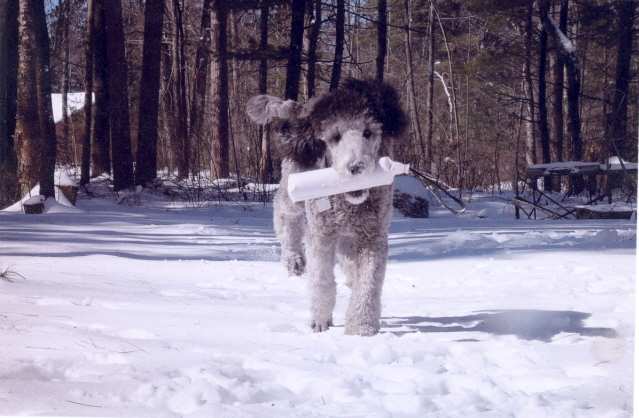 Unfortunately, at this point in time there simply are not enough breeders attempting to breed poodles with the temperament a field dog needs to retrieve ducks in freezing water, plus flush and retrieve shot birds in the upland. However, that is changing. 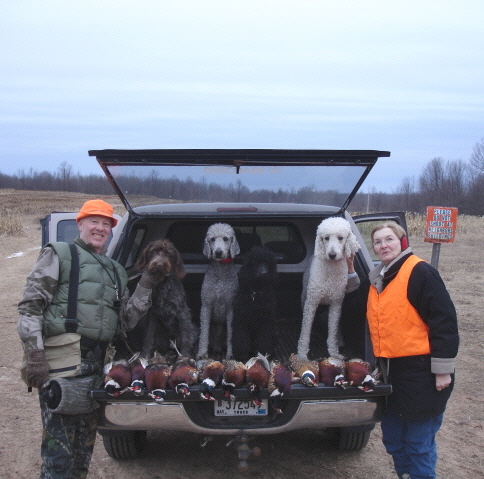 I'm not saying a hunting poodle cannot be found from parentage that has never seen a pheasant, duck, or goose. My two male poodles have proven that to me and now Callie has also. She has followed in Beau and Scout's foot steps. I can honestly say the two males and Callie hunt as well as any of the more commonly known hunting breeds and retrieve on land and water better than most. That's mainly because I started them young on live birds and trained them more than the average retriever I see in the field. Scout's sire, Powder, is a Junior Hunter with two Master legs, now retired. Look for those genes in both sire and dam. How does one know they're present?--hunt test titles can help. And finding the right breeder is the key. Start training that pup with live birds by 6 months of age or even younger and do not throw in the towel too early if things are not going well. Poodles mature slowly and may not show an immediate interest for retrieving in water at a young age like a lab Be patient and aware it will likely take some pressure--but go easy. Both males and Callie are still being conventionally trained as retriever's with as many birds as possible, alive and dead. They were force fetched with the ear pinch, E-collar conditioned, than walking fetch, forced to pile, double T, swim-by, etc. with the aid of remote training collars by me alone. Callie is now starting into the handling phase of training. Keeping all 3 in good shape never stops. I'm not a pro, strictly an amateur. When Beau and Scout were ready, just short of one year of age, I entered them in UKC and AKC beginning level hunt tests--Started and Junior respectively. Callie has her UKC Started Hunting Retriever (SHR) title plus the PCA WC and WCX titles and one AKC Junior Hunter pass to date. 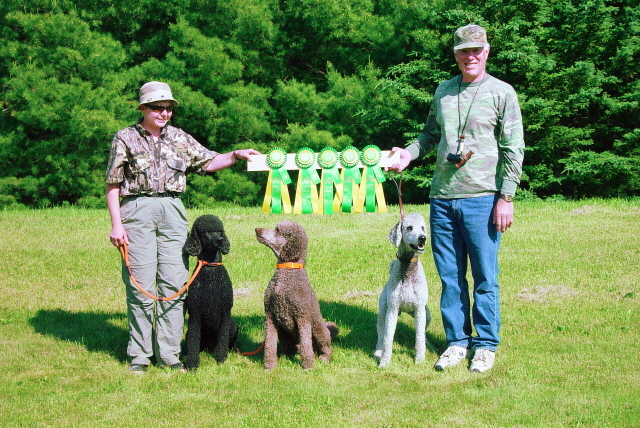 Both males successfully advanced through UKC Seasoned, and AKC Senior with no problems. Scout is still being tested in Finished and Master. He received his UKC HRCH title in TX, Mar. 2010. No hunting dog has to be trained and campaigned in hunt tests to that level of competence to be a decent companion in the field. 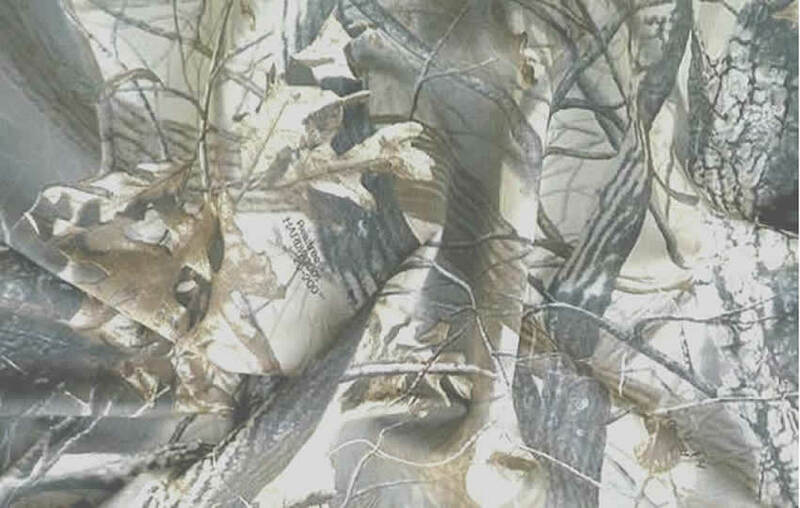 However, it sure does eliminate a lot of aggravation and it definitely improves the hunt. 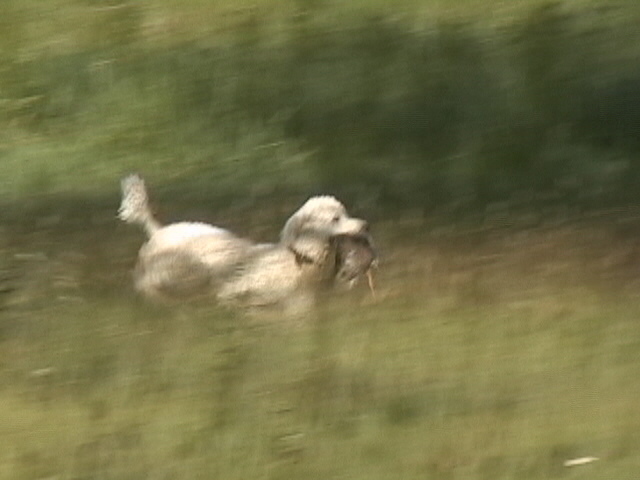 Beau delivering duck at the Midwest Regional first ever poodle only hunt test and WC/WCX. Start your poodle on birds ASAP. Scout on his way to his Senior title. 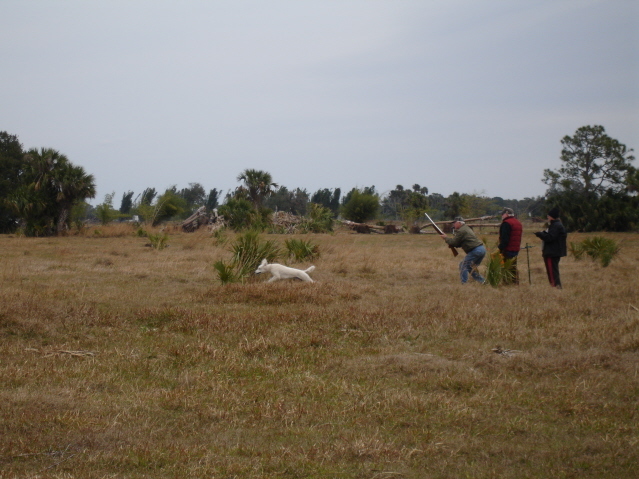 Beau's second and third seasoned pass for his Hunting Retriever title (HR).